soft Italian cookies, not too sweet just right! 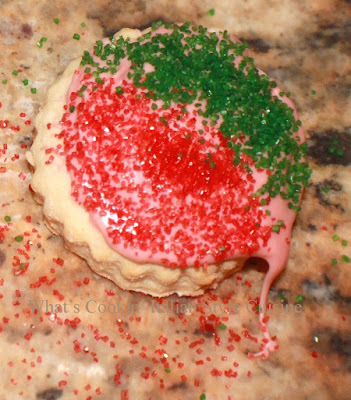 Christmas or your favorite Holiday this is a versatile recipe you can make anytime of the year and these will always be a hit anywhere! (Actually these are the best cutouts cookies I have ever had for any Holiday! I embeded links to the events for more recipes for those Holidays a well) Enjoy! Mix everything until smooth with an electric mixer. Roll out on floured board 1/2 inch thick using your favorite cookie cutter shapes whatever holiday or occasion it is. Bake at 400 until edges are set, around 8 to 10 minutes. Cool. Frost with homemade or canned frosting. bellissimi e buonissimi! Mi piacciono. Bacioni Claudia. Love the ricotta in them and that they are not too sweet. Just the loveliest valentines. Fond memories of these cookies Claudia. Haven't had them homemade since I was a teen!